There is something freewheeling about beach house cookery. All the familiar props, from tools to staple foods, are gone, and most folks happily make do with whatever they can find in a stranger’s kitchen cabinets and at the grocery store, seafood market and farm stand. Everything will taste delicious, after all, because most people who love the beach spend the entire day outdoors. Even if you do nothing more strenuous than laze under an umbrella with the latest page-turner, you somehow manage to work up an appetite. That’s why I am only fussy about a couple of things. The first is tomatoes. More often than not, I’ve been disappointed by the selection at coastal Carolina farm stands; typically, the tomatoes are commercial hybrids and not very interesting or flavorful. I always hedge my bets, then, by bringing plenty of good ’uns with me — both backyard beefsteaks and heirlooms in varying shapes, sizes and degrees of ripeness. I bring lots of them, enough for a week’s worth of salads and the best sandwiches in the world. I pack them in low cardboard boxes and nestled in beach towels, stem-side up so their rounded shoulders won’t get bruised. I’m also uncompromising about finding local wild-caught shrimp, one of my favorite beach eats. The brown shrimp (Farfantepenaeus aztecus) that are running now are sweet and fat. And whether you buy them from a seafood purveyor or roadside cooler, don’t be afraid to ask questions about their source. “Anyone selling shrimp should know who they purchased it from (if they didn’t catch it themselves) and should be able to provide some details (e.g., the name of the boat, the fish house, area of the coast, etc.) if it’s from North Carolina,” writes Scott Baker, fisheries specialist for the NC Sea Grant Extension Program. “The NC Catch organization has a directory for seafood retailers that provide local products.” NC Catch can be found online at nccatch.org. The last North Carolina shrimp I had were real beauts — just hours out of the hold of a boat working Pamlico Sound. This shallow lagoon separating much of the Outer Banks from the mainland is a remarkable body of water; it’s so broad and long that when explorer Giovanni da Verrazzano reached the coast in 1523, he thought he had reached the Pacific Ocean. My extended family that gathers at the beach expands or contracts depending on circumstances. What never changes, though, is a love of the surf and a great reluctance to leave the beach in order to go make dinner. That means we all share kitchen duty — and no one ever complains about the fact that peel-your-own boiled shrimp is the default meal. Add corn on the cob and a platter of those tomatoes, and you have easily attainable perfection in no time flat. When it comes to cooking shrimp, I’m a big believer in protecting the physical integrity — thus the flavor and tender texture — of seafood. Unless I’m stuck with very large shrimp, I never fool with deveining. Why open up that thin, resilient armor and risk coarsening such delicate meat? To my mind, there’s no beating the succulence of heads-on shrimp, but lots of people prefer the convenience that comes with buying them heads-off. I also cook shrimp in the smallest amount of water I can get away with, covering them by just 2 inches or so. As far as the seasoning is concerned, I add a quartered lemon and enough sea salt to make cold tap water taste like the ocean. If you are a fan of a seafood boil blend such as Old Bay or Zatarain’s, toss some in as well, but use a light hand — you don’t want to overwhelm the clean, briny-sweet flavor of the shellfish. James Beard famously declared that “the unpardonable fault in preparing shrimp is overcooking,” therefore attention must be paid. 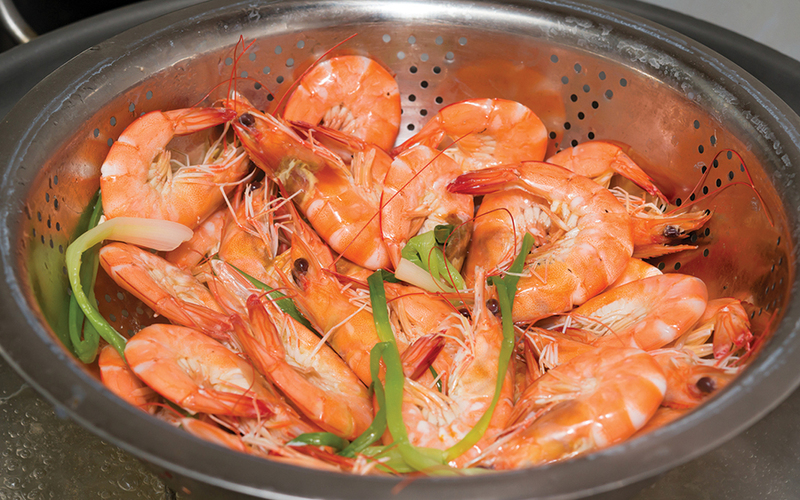 After bringing the seasoned water to a boil, add the unpeeled shrimp and start timing from that moment. Depending on the size of the shrimp and how many pounds of them are in the pot, begin checking for doneness at about two minutes. Once the shrimp are a beautiful rosy-pink on the outside, opaque inside, and firm yet tender in texture (cut one open to check), immediately drain them in a colander. Spread newspapers over the table and eat the shrimp hot out of the shell, with melted butter (add garlic or a spritz of lemon if the spirit moves), or cooled, with a horseradishy cocktail sauce. A New Orleans-style rémoulade would be wonderful too, but I don’t know — all that mincing and measuring sounds like too much work at the beach. The adults in my crowd can easily put away at least three-quarters of a pound of shrimp per person. Any leftovers are tucked into the fridge for lunchtime shrimp rolls the next day. Peel the shrimp and cut them into chunks. Add some Duke’s mayo, a little Dijon mustard, shredded carrot, chopped scallion, and perhaps some chopped red bell pepper or celery for crunch. Serve in lightly toasted hot dog buns. Then slather on more sunscreen and go outside. The surf is waiting.